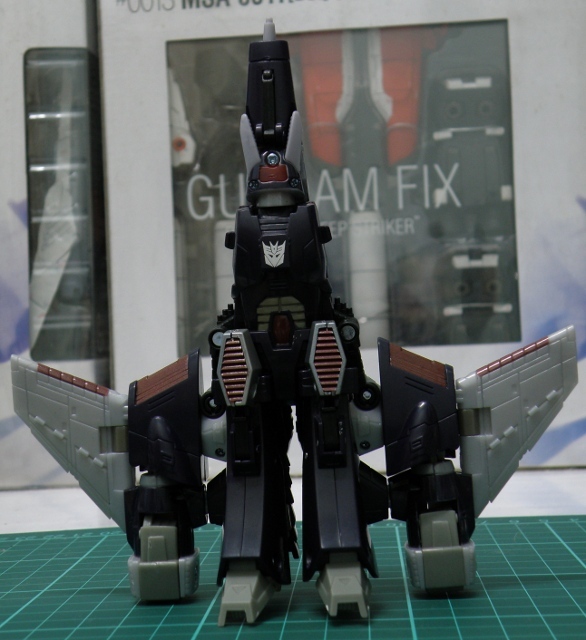 Transformers Classic Voyager Class Cyclonus, Cybertronian Jet Mode [Part2] | Out of the box. A futuristic sleek jet which is able to travel in space or in atmospheric flight Cyclonus is in its Cybertronian Jet mode. 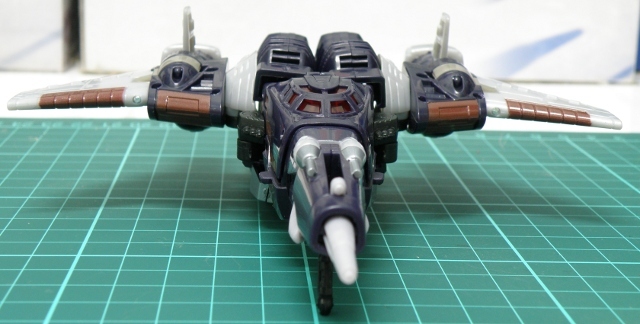 The only gimmick that Cyclonus has at his cybertronian jet mode has retractable landing gears. It has the a peg hole to hold NightStick in its gun mode on top of the cockpit/cabin. The scuplt of the toy is very detailed. Its thrusters is molded with details. The panel lines and contour of the jet engines can be seen. Its cockpit/cabin is also has detailed mold. Cyclonus Cybertronian Jet fron details. The Cybertronian jet looks edgy with sharp edges and has a radical inverted wings instead of conventional aircraft wings. 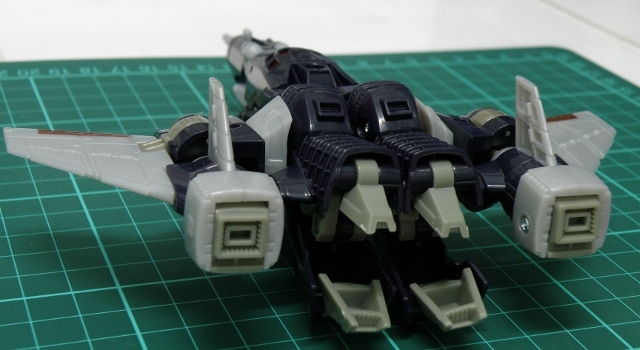 Cyclonus Cybertronian Jet top view. The landing gears is stored at the knees of the robot and below the nosecone, which is properly concealed. Unforunately, the nosecone is very loose and floppy, it will fall down retracted if the jet is place upright with its nosecone facing up. Another flaw is the 2nd half of the jet fuselage which its its legs is a bit loose and does not has a strong peg to secure the legs. 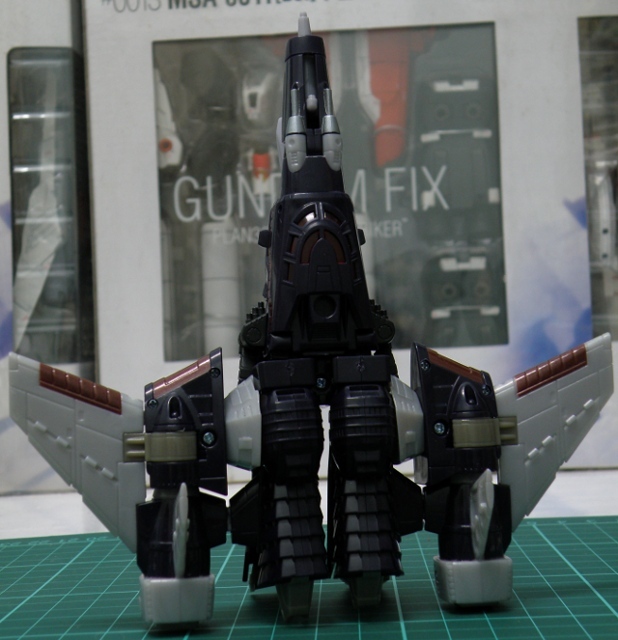 The underside expose most part of the robot chest, it is must to be desired if the robot part is fully concealed. Should the underside is not review Cyclonus has a very good alternate mode. To be continued to Cyclonus robot mode in the next post. This entry was posted in Mecha, My Hobbies, Transformers and tagged cyclonus, Decepticon, Destron, hasbro, hasbro transformers, henkei, takara, takara tomy, takaratomy, target master, targetmaster, Transformers, transformers classic, Transformers Universe by KarMeng. Bookmark the permalink.